Background: Ganoderma (Ganodermataceae), a genus of medicinal mushrooms, has been employed as an herbal medicine in Traditional Chinese medicine (TCM) for over 2000 years. The fruiting bodies have been used historically in TCM, while the mycelia, and spores are now also used as a tonic, to stimulate the immune system and treat many diseases, including cancers. Objective: To review the anti-cancer research on G. lucidum (GL) from 2005 up to May 2016 and correlate these data with analysis of the active chemical constituents. Methods: Literature searches were performed from 2005 to May 2016 in various databases such as Pub- Med, SciFinder, Napralert, and Google Scholar for peer-reviewed research literature pertaining to Ganoderma lucidum and cancer. Results: Of the >200 known Ganoderma species, only two species, G. lucidum (W. Curtis: Fr.) P. Karst and G. sinense Zhao, Xu et Zhang, are officially recognized as “Ling-zhi” in the Chinese Pharmacopoeia. Both species are thought to have similar biological effects. “Ling-zhi” is purported to have anticancer effects, and is also used in the promotion of health and longevity. Numerous polysaccharides and triterpenes have been identified in G. lucidum and have anticancer effects in both cell culture and animal models. Conclusion: The current published literature suggests that G. lucidum extracts have excellent potential for use in cancer therapy, as both the triterpenes and polysaccharides appear to have anti-cancer effects both in vitro and in vivo. However, many problems still exist including significant quality issues including taxonomy and identification of species, parts used, and the production of extracts with active constituents. 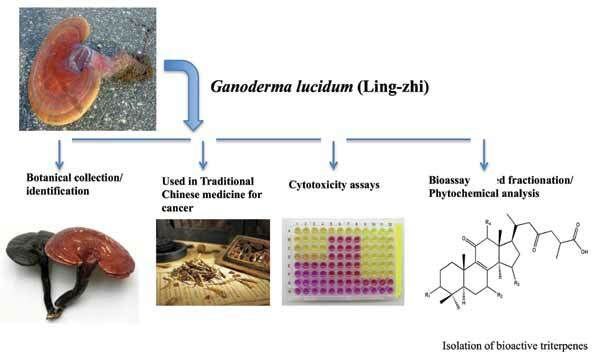 Keywords: Ganoderma lucidum, Ling-zhi, Ganodermataceae, cancer, polysaccharides, triterpenes. Affiliation:Director, Clinical Pharmacognosy Laboratories, Department of Pharmacy Practice, College of Pharmacy, University of Illinois at Chicago, 833 South Wood St., MC 877, Chicago, IL 60612, USA. Keywords:Ganoderma lucidum, Ling-zhi, Ganodermataceae, cancer, polysaccharides, triterpenes. Abstract:Background: Ganoderma (Ganodermataceae), a genus of medicinal mushrooms, has been employed as an herbal medicine in Traditional Chinese medicine (TCM) for over 2000 years. The fruiting bodies have been used historically in TCM, while the mycelia, and spores are now also used as a tonic, to stimulate the immune system and treat many diseases, including cancers.